The battle at Ruapekapeka (‘bats’ nest’), a sophisticated pā built by the Ngāpuhi chief Kawiti, ended the Northern War. Debate soon raged as to whether the fortress had been deliberately abandoned or captured. The Northern War erupted in March 1845. Ruapekapeka gave the new governor, George Grey, an opportunity to establish his authority following the failure of his predecessor, Robert FitzRoy, to win a decisive victory. As well as 1300 British troops and navy personnel, Grey had 400 kūpapa Māori (Ngāpuhi rivals of Hone Heke and Kawiti led by Tāmati Wāka Nene). The British trudged for three weeks across rugged country. 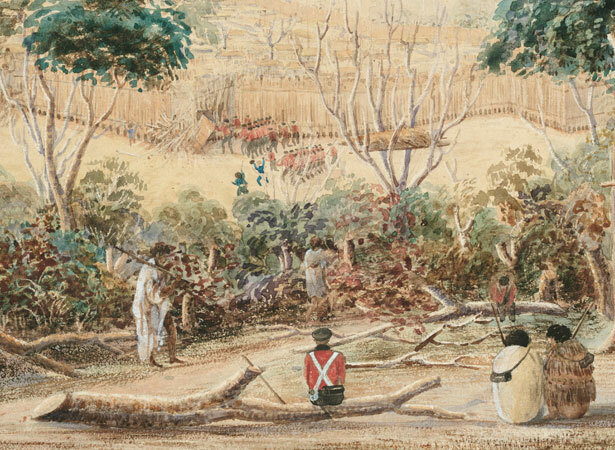 When they reached Ruapekapeka in early January 1846, they outnumbered their opponents by four to one. On 10 January, a bombardment created three small breaches in the palisade. Next morning the pā was found to be nearly empty. The British chased its few occupants towards nearby bush – and a possible ambush, which they were able to avoid. Following the battle, the Māori antagonists made peace, leaving Grey little choice but to pardon rather than punish the ‘rebels’. We have 2 biographies, 4 articles, related to Ruapekapeka pā occupied by British and Māori forces.